The campus bee orchids are back in flower even though their early growth was inadvertently mown off. These intriguing flowers arrived on Whiteknights campus in 2011 but have flowered every year since then. The labellum – the dark coloured and exotically patterned petal mimics a female bee and lures in the male to mate with it. However it is not the bee that ends up mating but the orchid which uses the bee as a go-between. You can see the special bright yellow pollen sacs hanging on narrow white threads in the right hand image. The labellum is actually the upper petal of the flower but orchids twist their flowers upside down during development so the true upper becomes the lower petal. This entry was posted in Flowering Plants, Orchidaceae, Phenology, Plants. Bookmark the permalink. I am a current student at the University of Reading. 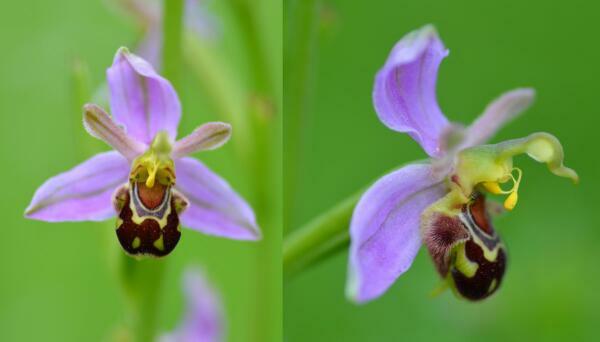 I would love to see the bee orchid. Where should I look to find these flowers on campus? I also heard they can be found at Hartslock BBOWT Reserve but have not seen any yet. I would be very interested in looking at these flowers too, if you could let me know where to find them. I am a member of staff in the Careers Centre.